For those of you who aren't familiar with The Burning Man festival its important to understand how radically different it is from any other festival in the world, and for those of you lucky enough to have experienced The Burning Man for yourself, you will appreciate how difficult it is to accurately describe the experience and do it justice. However, I am going to attempt to give it a go. The reason so many people describe The Burning Man as being so different from other festivals is due to the festivals ethos and culture, that is explained in the 10 Principles of Burning Man protecting the festival from being tainted by profit, greed and consumerism, This means you wont see any advertising or any money changing hands and everything on offer is free, All the bars and food kiosks scattered across the site offer free booze, food and their services totally free of charge. 3#Decommodification - Protecting the festival from commercial sponsorships, transactions, and advertising. 5#Radical Self-expression - Respecting everyone's freedom to choose how they express themselves. 6#Communal Effort - Promoting and protecting community values. 8#Leaving No Trace - Leaving no physical trace of your activities and wherever possible leaving a place in better condition than how you found it. 9#Participation - Everyone is invited to work. Everyone is invited to play. This ethos and culture is exercised throughout the intitrer festival, from the way every camp functions to the building and installation of every work of art. The festival is laid out like a clock face with layered rows of camps sites starting from the outer edge working there way inwards; with a vast expanse of desert filled with installation art you can interact with at its center. Every camp located in the rings around the festival site is made up of a community of volunteers working together to provide a creative and sensory experience for others. These camps are not just places to sleep and recharge, they provide free entertainment, music, parties, art often complete with a free bar and sometimes great food. You may be thinking this sound like a form of Skinner utopia and you wouldn't be that far off the mark in thinking so. It may just be an art festival in the middle of the desert but in actual fact its much more, its a model for how humans could live better with one another without anyone having to go without. Yes its probably completely unsustainable but for 6 days of the year, towards the end of August, beginning of September, the burning man festival brings together 90,000 people, all sharing an environment rich in creativity, your eyes just won't fully believe what they are seeing. A friend of mine once described the burning man as being a huge Charlie and the chocolate factory style playground on the surface of the moon. It’s a good description and pretty much sums up my experience the two times I’ve been. The Burning Man festival was originally conceived as an arts festival on Baker Beach in San Francisco back in 1986 where people gathered to assemble installation art on the beach for everyone to enjoy. As night descended all the art was committed to the flames in a bonfire under the stars. As the festival gained popularity over the years it eventually had to relocate in 1990 due to its size. The festival was moved to a vast prehistoric desert lake called the playa or Black Rock Desert, about 120 miles north of Reno. This new site allowed the festival to grow to what it is today. Now the festival displays huge installation art sometimes 5 stories high on a site that covers a circular patch of dust 4480 acres in size for 90,000 people to play in. When you think that Glastonbury festival covers a site 1,300 acres in size for 175,000 people to squeeze into, you get a better idea of how huge the burning man site is… This is why everyone gets about via bike, it simply isn't possible to get where you want to be in the festival without a bike. Although parking your wheels so you can hitch rides on the hundreds of different mutant art cars can be the perfect way to spontaneously explore and see even more. Ask any DJ who has played at Burning Man and they will tell you that it’s the best place to play in the world. This is probably why they have no trouble booking some of the best DJs in the world for free. One of the reasons why some of world’s top DJs come to Burning Man to play for free is due to the immediate access they have to really great crowds, 50,000 party people all dancing like their lives depended upon it every day and night over a 7 day period. No matter what size your audience is the crowd will dance and show their appreciation to the DJ as though you’re a headlining act. The Burning Man never set out as a music festival and the role music and dance parties play at the festival has often divided opinion. Mainly due to a series of unfortunate events occurring at some of these dance party camps in the 90's; threatening the continuation of the festival. However since the introduction of some strict but life saving requirement on how these party camps are run. Music and art now co-exists much more harmoniously than ever before. DJs now contribute to some of the festival's most loved and celebrated attractions. Anything from a banging set played from the roof of a crazy art car transporting a mobile party of crazy dancers to a mega sized party camp constantly being replenished with hundreds of ravers. 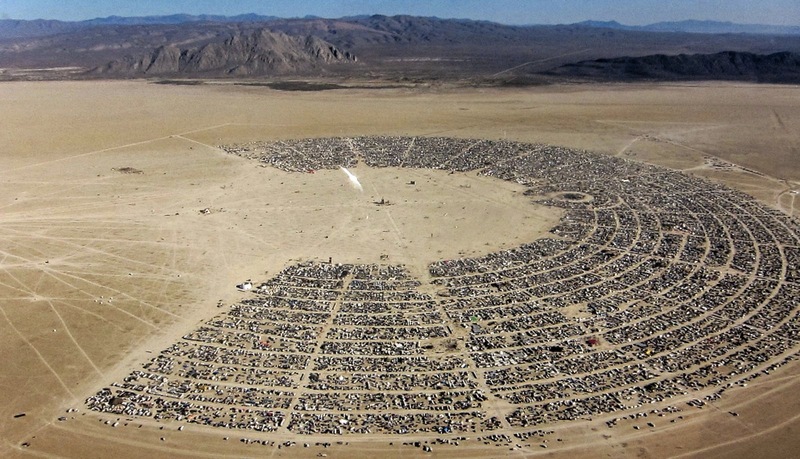 If you want a taste of DJing at burning man the best way to go about it is to do some research on all the different camps preparing for the next festival and enquire about joining one you can DJ for. Find a camp that suits you and approach them about joining and how you'll be involved contributing to the daily running of the camp. The more of a team player you are the better your offer will be received. Or if you haven’t had any luck approaching the camps in advance just turn up with some of your tracks and your dj headphones, and with a friendly attitude you will score a few DJ gigs in no time. There are booths everywhere, in art installations, various camps, inside crazy looking art cars, on top of crazy looking art cars, just about anywhere you think of you can find a DJ booth; and many DJs only secure a gig moments before they play. A lot of these stages play to the crowds 24/7 over the 6 days and this means the people in charge will be unlikely to turn away a DJ good enough to play live. Taking the time to forge new friendships with other DJ’s and camp organisers over the course of the festival will hook you up with a gig in no time..